This is a collection of 64 heavy dubstep patches for Massive. 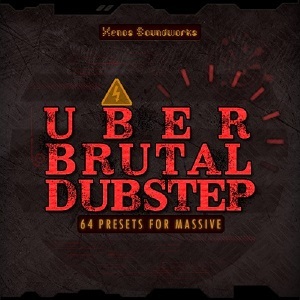 'Uber Brutal Dubstep' lives up to it's name, offering psychotic and rage-infused growls, drops, bass loops, subs and wobblers. Rounding out the collection is an assortment of dubstep-friendly leads, plucks, pads and other synth sounds. Inspiration was drawn from such artists as Trollphace, Virtual Riot, Zomboy, Skrillex, Flux Pavillion and others. Each preset is velocity sensitive for dynamic playing, and all 8 Macros are assigned to each patch for maximized variation and expression. The soundset ships in both KSD and NMSV formats. This offer is good no matter which online shop you purchased it at. If you do not receive an update email when the set is released, simply show proof of past purchase and 'Uber Brutal Dubstep' will be sent to you at no cost. We're pulling out all the stops to send a clear message: We are serious about customer satisfaction and having a reputation for quality sounds.